AcroYoga Builds Strength and Parent-Child Bond | Fit Families | Kids VT - small people, big ideas! This stretch is great for the back and hip flexors. Sit back-to-back with legs crossed. Extend your right arms to the side and left arms into the air. Then shift your bodies to the right so your heads are side by side. Lean back until your heads rest on each other's inner thighs. Extend both arms to the side and relax into the stretch. 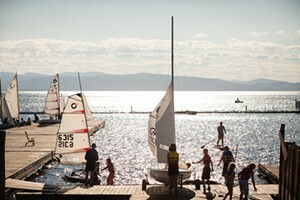 Finding an activity that parents and preteens can enjoy together might feel like a stretch. But sometimes, that's exactly what's required. Recently, my 12-year-old son, Adam, and I worked together in a remarkable way: We learned to fly. No, we didn't grow wings. But he did lift off the ground, performing daring aerial maneuvers as I supported his body. It all happened in AcroYoga class. I came upon the practice — which combines acrobatics with yoga and Thai massage — as I was searching for exercises to help Adam relieve his growing pains and stiff muscles. I was intrigued, and we already had some related experience: We'd done traditional family yoga together before. While it helped, the classes were geared toward young children. We were ready for a more formidable challenge. Developed in the 1980s, AcroYoga was originally called contact yoga. It requires at least two people but works best with three or more. One person lies on the ground as a base, while another (the "flyer") balances on their partner's hands and feet. A third person spots the flyer and keeps everyone safe. 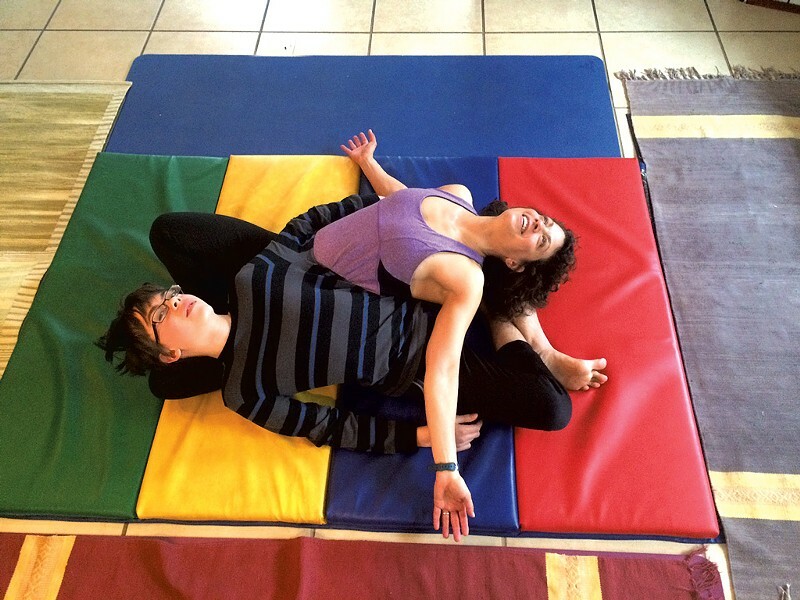 I scored a one-hour private AcroYoga session with Lori Flower for $40 — discounted from $75 — through the Localvore Today website. We met Flower at her studio, which is the mat-lined living room in her tidy Waterbury home. After briefly warming up with leg and back stretches, Flower enlisted me to demonstrate poses while Adam watched. We started with the folded leaf pose. Flower reclined on the mat with her legs in the air while I stood facing her with my feet close to her bottom. I leaned forward, and she caught my thighs with her feet, our hands pressing together. The small-statured instructor hoisted me into the air with ease and told me to extend my arms and legs. This was all well and good, but I wondered aloud how I would lift Adam's 95-pound frame. That's when Flower divulged the secret: bone stacking. When a support person aligns their ankles over knees and hips while using their feet to balance someone, the pressure shifts from their joints and muscles to their bones, which can bear more weight. And when the flyer pushes their hands against the supporter's hands and both people straighten their elbows, it creates a strong, stable line of support without straining the shoulders. Soon it was our turn. I felt an awesome stretch in my hamstrings as Adam extended his body over mine. When we felt stable, we moved into the bird pose. With Flower spotting, Adam let go of my hands and brought his arms behind him like soaring wings. I flexed and pointed my toes to rock him back and forth. We learned several more poses including one called the high-flying whale, where Adam did an aerial backbend that allowed him to flex his spine while I massaged his back with my feet. At first it seemed like the base person was doing all the work. But we soon discovered that it was even more strenuous for the flyer. "It's sort of like how it is when you're walking," Adam suggested. "When you walk, it's harder for you than it is for the floor. The floor just holds you up." Adam felt the exertion in his abs and glutes. After the session, we agreed that doing poses together helped us tune in to each other. "I feel stretched out and really relaxed," Adam said. And, best of all: "I liked it because I was with you." Drop into Flower's AcroYoga class on Wednesdays from 11:30 a.m.-12:50 p.m. at Topnotch Resort in Stowe. Book a private session or schedule an AcroYoga birthday party through Flower's website. To find other AcroYoga classes and instructors, visit acroyogavermont.com/classes or Acro Yoga Vermont's Facebook page.